To get a perfectly boiled egg you need an inside man. Someone who can think, act, and sing like an egg. Okay, maybe not that last one, but that’s how the BeepEgg lets you know your egg will come out just the way you like it. 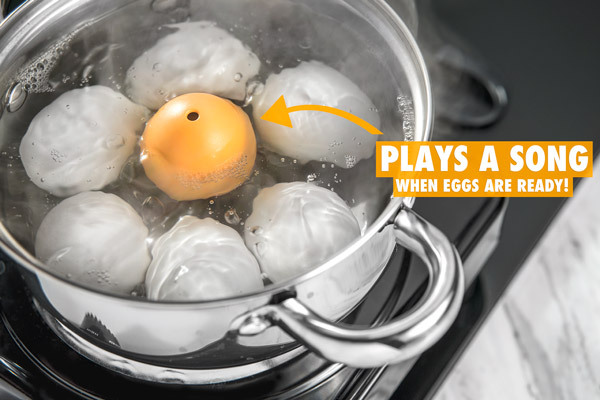 Just throw the BeepEgg into a boiling pot alongside your real eggs and it will constantly measure the outer temperature along with its own core temp. 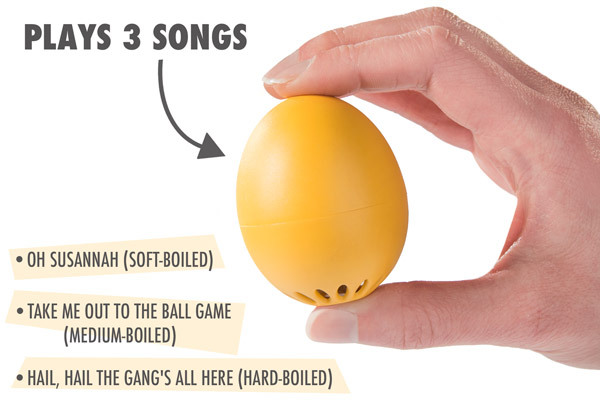 Once it reaches the right heat to be soft-boiled, medium-boiled, or hard-boiled, it will play a unique ditty for each to let you know. Pull out the BeepEgg along with the chicken eggs and enjoy a perfectly cooked snack. The BeepEgg’s internal thermometer monitors your eggs for you, so you can focus on the rest of your breakfast preparation. It’s great for hectic mornings or cooking for company. 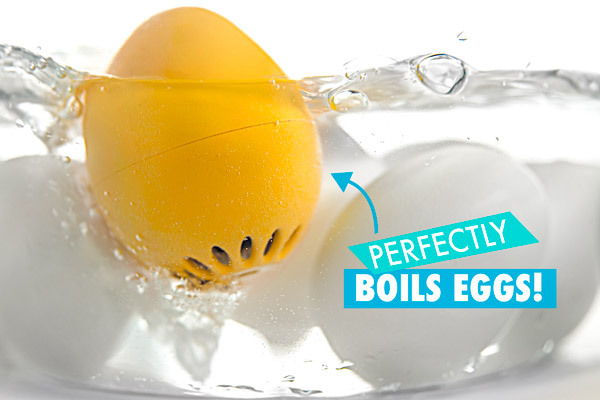 The BeepEgg can help you cook soft, medium, or hard boiled eggs so you can make multiple orders in the same pot. When you hear the first song (“Oh Susannah”), remove your soft-boiled eggs. Then, leave the BeepEgg in the water with the remaining eggs and wait for the next tune! The BeepEgg is able to achieve its awesome accuracy because it measures temperature and not time. Think of an egg timer as an estimate for when your eggs might be ready, while the BeepEgg can practically peek inside the shell. Keep your BeepEgg with the edible ones so it starts at the same temperature as your eggs; that way, the BeepEgg can tell you exactly what’s happening on the inside. Because the indicator is based on the temperature inside the egg, the BeepEgg is amazingly accurate at any altitude! Cook time, like spacetime, is relative. The tea kettle whistles, the bacon sizzles, and now the egg sings. 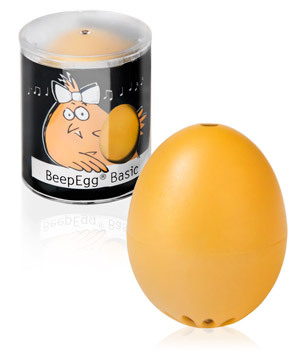 The BeepEgg plays a different song at each level of egg consistency. You’ll hear “Oh Susannah” when your egg is soft boiled, “Take Me Out to the Ballgame” for medium boiled and “Hail, Hail the Gang’s All Here” when you have a hard boiled snack. Besides adding a little music to your morning, the use of audio lets you keep your attention elsewhere so you’re not stuck watching a pot boil... which never boils that way. I know why the cooked egg sings. Question: How is this different from a kitchen timer? Answer: The BeepEgg is superior to a timer because it monitors the actual temperature of your eggs. This ensures greater precision with your cooking than estimates based on the correlation of known time and an assumed temperature. Question: Can I program my own music? Answer: No, the BeepEgg songs can not be changed. Question: Will this work at high altitude? Answer: The BeepEgg works at any altitude! 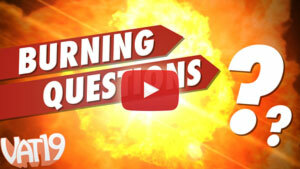 Cook times vary at different altitudes because water boils at different temperatures. But the BeepEgg monitors internal egg temperature, so it remains accurate no matter where you are!